Ok I am the first to admit, I never really put a lot of thought into my PC audio. It was were there and I guess I just never really wanted to invest in better audio and or speakers. Well today I am going to compare my lazily put together “2.1” Sanyo soundbar and Creative sub-woofer, that I janked together to make work, to a system that really makes a difference when it comes to a high fidelity audio solution from SVS Sound. I guess the question in my mind is, does higher ended audio make a difference in gaming? Prior to CES, I am gonna come clean, I have never heard of SVS Sound. Being a bit naive when it comes to audio, all I knew of was the bigger brands like Sennheiser, Bose, Audio Technica, Alpine, Pioneer, Sony, Samsung, and LG. Well at CES I visited the SVS suite and was pleasantly surprised with the sound quality that I heard. When SVS offered to send me over a pair of their Prime Wireless speakers and an SB-1000 sub-woofer, this was an opportunity to see how crappy my audio setup actually was. Well here we are, but before we talk about sound quality, let’s have a look at the pricing and construction of the SVS Prime Wireless Speaker system. The SVS Prime Wireless speaker system can be purchased as a single (mono) for $499 or dual (stereo) configuration for $599. Being OCN, a single mono speaker would simply not do. I would have to agree that most of us on OCN would rather have two speakers, especially since it’s only $100 more to add a second passive speaker to the already active speaker. Each speaker cabinet is equal in size, but not in weight, as the first Prime Wireless speaker has an active amplifier, which weighs in at 9.55 lbs, with the second passive speaker weighing slightly less at 8.73 lbs. The built in amplifier, which actually is dual class-d amps for bi-driver amplification, that powers each speaker cabinet with 100 watts of RMS power, 50 watts to the 1” aluminum dome tweeter, and 50 watts to the 4.5” mid-range driver. A digitally controlled tweeter to woofer crossover at 2khz with a 12db octave slope, is present to control frequencies. The front of each Prime Wireless speaker is covered in acoustically transparent and FEA optimized grille that minimize diffraction. Each speaker cabinet has a piano gloss finish with colors coming in black and white. Fingerprints would be evident on the black gloss model, but honestly how much would one even handle their speakers? Personally the finish IMO is stellar. Accommodating just about every imaginable connection, Optical SPDIF, RCA, and AUX inputs can be used for wired connections. A sub-woofer output, 2 Ethernet ports, and a USB port also aid in the connection department. A mono to stereo switch is present, however I don’t see one messing with the configuration that much. As the name suggests, Wireless is the Prime Wireless Speaker system’s strong suit. Pandora, Spotify, Amazon Music, and others, can all be accessed via a smartphone or other compatible mobile devices. All this magic is done via WiFi and or Bluetooth. The app that one would use is the DTS Play-Fi app, which is available for iOS and Android, is the best way to go wireless via a smartphone. The way that I have the SVS Prime Wireless system hooked up is in wired configuration, of which the source being my computer, via a optical SPDIF cable to the SVS Prime Wireless active right speaker. On the PC side, I set my sound profile to the 24-bit/96khz sound resolution which the optical SPDIF connection on the SVS Prime Wireless can handle. Also something to note, the Prime Wireless can also handle a 24-bit/192 khz sampling rate via its Wi-Fi connection. I also did test the Prime Wireless with the Bluetooth connection and found that latency was really good, however I prefer a wired audio connection for gaming. On the music side of things, of which the SVS Prime Wireless Speaker system also excels at, aims to be somewhat of a SONOS competitor. Having a multi-room capability via the DTS Play-Fi app, one could control audio in several different rooms of a Wi-Fi enabled household. So the cherry on top is the SVS SB-1000 sub-woofer, which when connected, a 2V auto detecting low pass filter at 80Hz is engaged. The SB-1000 features a 12 inch, front firing, 300 watt RMS with 700 watts peak amplifier, all stuffed in a 13x13x13 enclosure. Pretty impressive. Let me tell you, this thing pounds. With a 24 - 260 Hz range, this reminded me of my car audio days with my subs rattling the crap out of my car. Thank god, this is so much more refined. 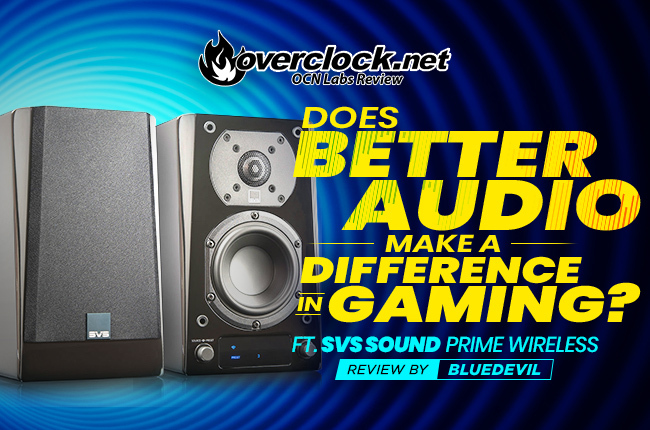 So in conclusion, the SVS Prime Wireless system simply put, is amazing. Sound quality is leagues better than any PC only solution, while being just as easy to set up. In comparison to my “2.1” soundbar sub-woofer hack job I did, wow. The highs are crystal clear, the mids are pronounced as well as bass is handled beautifully by the SB-1000 sub-woofer. The SVS Sound Prime Wireless Speaker system by itself is impressive, it gets even better when you add in a quality sub-woofer to let the left and right channels take care of the mids and highs correctly. Let me tell ya, it doesn’t get much better than this. The only downfall would be pricing compared to PC speaker solutions, however the old saying goes, “you get what you pay for” which is definitely true here. To put things into better perspective, SVS Sound only does audio. That can’t be said for a lot of PC speaker manufacturers. The SVS Prime Wireless Speaker system is a step up from the already great SVS Prime Satellite that the company debuted a few years back. The shortfall was that it needed a quality receiver to be powered. This led to more connections being used. So now with quality in mind, SVS Sound has hit the nail on the head, you just have to be willing to pay for it. With that, 5 out of 5 flames. The SVS Prime Wireless Speaker system blew me away, with sound quality, loudness, all while not sacrificing clarity. Look no further, these speakers should last you a millennia. Alright guys, I am gonna go enjoy these phenomenal speakers some more, if you haven’t liked and subscribed by now, you know what to do. I’ll see you in the next one. Last edited by ENTERPRISE; 03-14-2019 at 11:07 AM. So, did it make a difference in gaming for you? If so, are we talking about improvements to just immersion or performance as well? Well audio is subjective, but yeah I could hear things I couldn't hear before. Footsteps, gunshots all the like. But all in all, it was way more immersive. - How detailed or accurate is the 3D imaging provided by the new setup compared to what you were previously using? — Are you able to to tell where a sound is coming from better, like if it is from the left / right, front / back, or diagonally? — Are you better able gauge the distance of sounds, like that gunshot was about 10ft away or those footsteps were behind me to the left from roughly 5ft away? — you mentioned that the treble, midrange, and bass are all handled very well, are there any particular parts that are more emphasized than others or is it a pretty balanced sound signature? — While the subwoofer no doubt vastly enhances the lower end listening experience, can the pair of speakers hold their own without a sub or do you feel like you have to have some sort of sub? — Since there is an active speaker with a high quality amp, do you notice any excess heat coming from the speakers themselves? — How forgiving are they for music sources that are not recorded in or provided as high quality? — In your opinion, is it worth it for gamers to go from their typical cheap-o Logitech, Razer, Corsair, or Klipsch Pro Media setups to this $1K setup? Thanks again for your patience in addressing my curiosity! In your opinion, is it worth it for gamers to go from their typical cheap-o Logitech, Razer, Corsair, or Klipsch Pro Media setups to this $1K setup? I'm going to give my 2-cents on this. I won't say the featured SVS product is overpriced because the price range of quality audio goes a lot higher than this. What I will say is I can think of a couple of good wired/wireless solutions for less than the SVS speakers alone or just a little more depending on speaker/sub combo. -SMSL AD18 [~$150] or NAD D 3020 [$400], speakers of your choice [Polk S15 [S10 if running a sub], Kef Q100/150, Elac B5/6/5.2/6.2, Cambridge Audio SX-50, PSB Alpha P3/P5, MartinLogan Motion 4i, ...etc. ], Dayton 12" or BIC F12 or other for the sub. Funny you should mention that. I am gonna try and compare others like the Audioengine or others. Gonna try and reach out to see. For me though, I have always strove for higher quality since I listen to music on my PC all the time and wearing headphones for too long can get suffocating. That said, I am always curious of the impressions for those gamers who make that initial leap into the "audiophile" world. Do they find it worth it? What sounds different to them? Is that system dedicated to a desktop PC area or a home theater setup which includes PC? I only have a HT system [currently an old Denon avr-1707 and a pair of Polk S20 [39hz-40khz] in 2.0 stereo, though I have an Onkyo NR676 still in the box until I decide on a new stand for everything]. A PS4 provides the main source of gaming with this audio system. I only hook up the laptop occasionally, the 676's front HDMI should increase the frequency that my laptop pulls console duties too. The 676 also upscales to 4k [in case my future UHDTV doesn't] and I'm curious if it does a passable job. I was semi-impressed seeing the Switch upscaled on a 65" 4k Samsung HDTV. As for impressions from when I switched, it varied into three camps, those songs that sounded good but not different, those that sounded like a nostalgic experience like hearing an idyllic presentation of something familiar, and then a few songs [like Genesis - Man On The Corner] were completely different and more intricate than I previously realized. A note on the Fluance Ai40/60, they feature DSP sound processing. Other speakers that have this feature include the Edifier R1700BT [$150] ...as well as the aforementioned Edifier S2000Pro [$400], and Vanatoo Transparent Zero [$320-360]. Another common budget audiophile solution is the JBL 305/306/308 powered studio monitors, although the 308s are really only "budget" when on sale. -A lot of quality audio [especially speakers/subs] seems to go on sale every ~3 months almost regularly, so it's worth finding the speakers you like more than what you can just find at the moment. -Crutchfield, Accessoriesforless and Craigslist are always worth a lurk. -Old audio doesn't equal bad audio, especially if it has some digital inputs. -Philosophically, amps [...with or without DACs] are the equivalent to the CPU in PCs, speakers are the equivalent of the GPU in PCs. [...why do you think they call it "stereo imaging"?] Amps need to be adequate to "run" the music, but better speakers reproduce better resolution [more detailed sound]. -Tech has let speaker quality trickle down to the point that a good ~$500 amp/speaker system is within ~90% of the performance of a ~$2000+ amp/speaker system. Last edited by thegreatsquare; 03-19-2019 at 05:50 AM. I have a TX-NR676 and it doesn't upscale to 4K. The 676 just allows 4K pass through @ 60FPS (4:4:4 Chroma SDR and 4:2:2 Chroma HDR). However, my Samsung 55" KS8000 does upscale. I no longer have my PC running through the receiver but I do run my Nintendo Switch through it and everything looks pretty damn good. I have grown extremely fond of 4K HDR content on this setup (Apple TV 4K). The color is so rich and amazing. Onkyo has been my receiver of choice for about 10 years now. I know there are better options out there, but for the price ($330 on sale last summer), I have nothing bad to say about this receiver. Problem with speakers for gaming is the directional audio is always off. Most of us will never be able to set them up in a prefect environment to get correct directional sound. If you want the most immersive sound possible you're better off with headphones.